The proposed book will act as a guide for scientists and clinicians to the unique information that MRS can provide. It will be a comprehensive overview of clinical and pre-clinical MRS applications and potential clinical utility of MRS biomarkers in degenerative brain diseases from leading experts in the field. MRS has proven to be a powerful complementary tool to MRI for the diagnosis and monitoring of disease progression and response to treatment because it can detect changes in cell density, cell type, and biochemical composition, not just structural changes. As the population in the developed world continues to age, neuroimaging for diagnosis, prognosis, and therapy monitoring of neurodegenerative diseases becomes increasingly important and there has been a recent surge of clinical and pre-clinical applications of MRS indicating that this technique can provide robust and non-invasive biomarkers of degeneration. 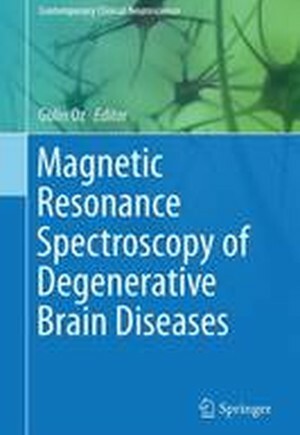 Imaging Neurodegeneration: What can Magnetic Resonance Spectroscopy Contribute?.- Methodology of MRS in animal models: Technical challenges and solutions.- Methodology of clinical MRS: Technical challenges and solutions.- Magnetic Resonance Spectroscopy in Dementia.- Magnetic Resonance Spectroscopy in Parkinsonian Disorders.- Magnetic Resonance Spectroscopy in Huntington's Disease.- Magnetic Resonance Spectroscopy in Motor Neuron Diseases.- Magnetic Resonance Spectroscopy in Multiple Sclerosis.- Magnetic Resonance Spectroscopy in Ataxias.- Magnetic Resonance Spectroscopy in Prion Diseases.- Magnetic Resonance Spectroscopy in HIV-Associated Neurocognitive Disorders (HAND).- Magnetic Resonance Spectroscopy in Epilepsy.